Following the death of the Labour MP Harry Harpham on 4 February 2016 the Sheffield constituency of Brightside and Hillsborough goes to the Polls today for the election of a new MP. Created in 2010 following a review by the Boundary Commission, the constituency is essentially the successor to the Sheffield Brightside. Since its creation for the 1885 General Election Sheffield Brightside had elected a Conservative Member of Parliament only twice: James Hope in 1900 and Hamer Russell in 1931. Indeed, since 1935 it had been a staunchly held labour seat which is perhaps identified in the minds of many today with David Blunkett, its long-standing labour MP, 1987-2015. 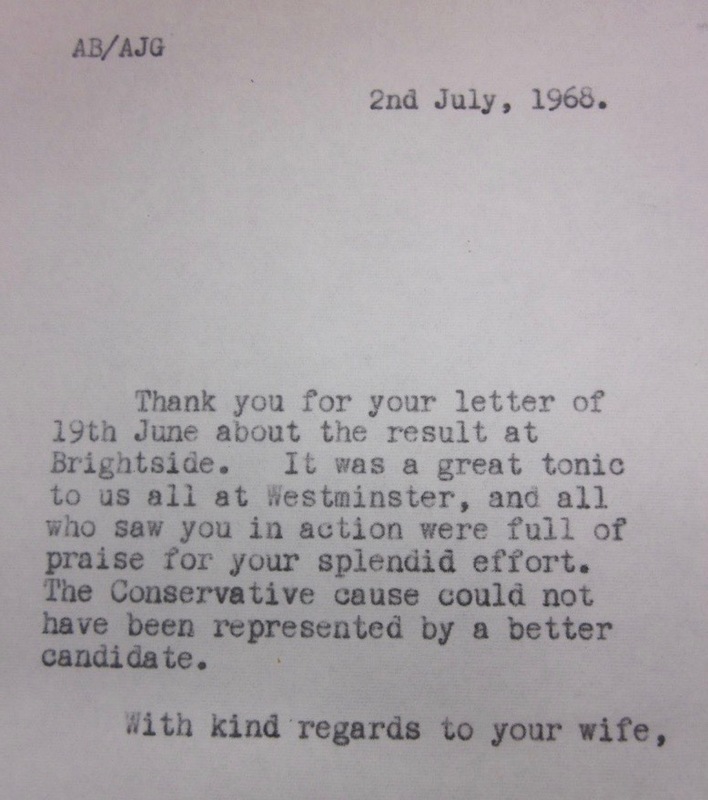 The papers of the Conservative Party Archive held at the Bodleian Library allow us to look back to the last by-election of Sheffield Brightside on 13 June 1968 held after the death of Richard Winterbottom who had been elected in the 1950 General Election. Even to contemplate a Tory victory at Brightside – there are only 13 safer Labour seats in England – would have been ludicrous once. But times have been so bad for the government for so long that anything becomes possible. 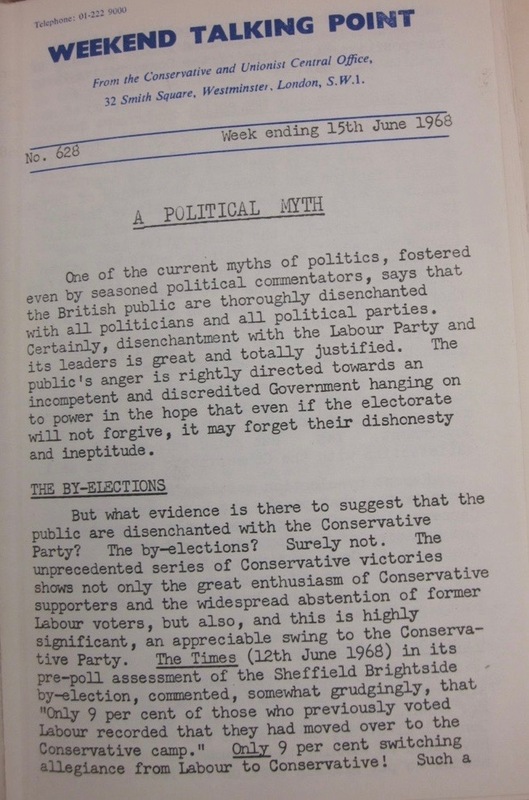 The Times newspaper undertook one of only two polls in the constituency and reported its findings on 12 June 1968 (CCO 20/55/24). 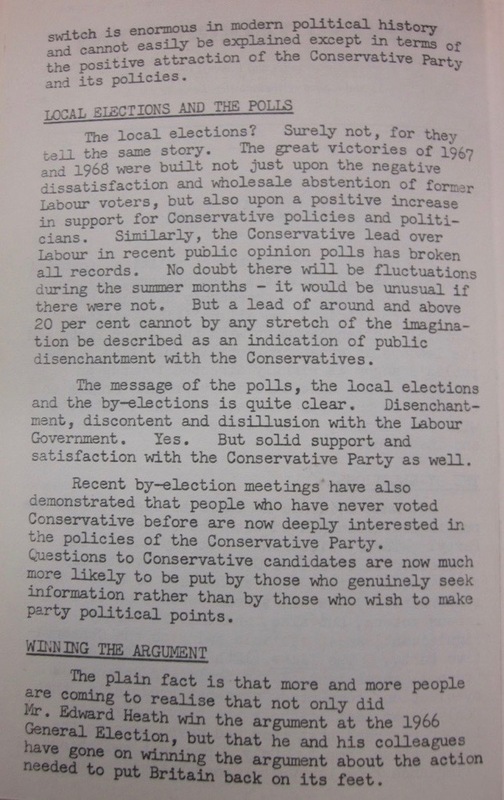 The poll had found that of those electors who had voted for the Conservative Party in the 1966 General Election, 9 out of 10 had declared their intention to vote for the Party again. This was in stark contrast to the Labour supporters of whom only 63% pledged their continued support. Although it did not predict a Conservative Party victory in Sheffield Brightside, the paper did anticipate a sizeable swing in their favour and a significantly reduced labour majority. As a Sheffielder [Lt. Col. Lambert] did not feel it right that such a division should be fought for by two “foreigners” particularly when for the first time the chances of winning it from Labour were good. During the past 48 hours, Col. Lambert approached them for support and it has been reported that 11 of the Tenants Association Committee are assisting him in his campaign. Whilst at this stage Lambert’s specific platform remained unknown, the basis of his support was no doubt potentially quite problematic given that Sheffield Brightside was a predominantly working-class constituency where 80% of its electors were Council House tenants in pre-war properties at a time when the Labour controlled City Council were introducing an unpopular rent rebate scheme amongst its tenants. So who were the two interlopers referred to in the Lambert press report? The Labour candidate was Eddie Griffiths, born and residing in North Wales, an industrial chemist within the steel industry who had, in March 1968, been appointed one of the first worker directors of the British Steel Corporation. A preliminary Conservative Party Report dated 15 February 1968 (CCO 500/18/115) had noted that Sheffield Brightside was home to the largest non-nationalised steel firm, Arthur Lee & Sons Ltd. Mr Griffiths, though perceived as a foreigner by Lambert, clearly had a major connection with many within the electorate particularly when there were plans for the diversification of industry by the Conservative group on the Council. 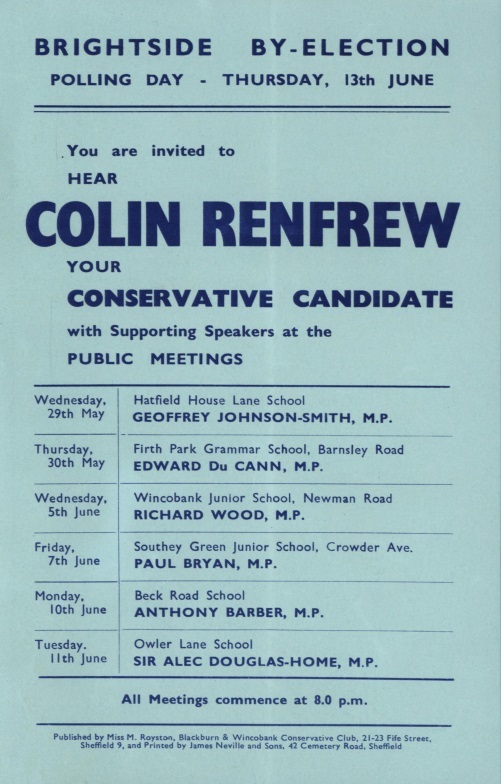 The Conservative Party’s ‘foreigner’ was Dr. Colin Renfrew who had been born at Stockton-on-Tees to a father who worked for ICI Plastics but had moved to Welwyn Garden City at around the age of three. Renfrew was an academic who had been appointed to the post of Assistant Lecturer in the Department of Prehistory and Archaeology at the University of Sheffield in 1965 after the award of his PhD in the same year from the University of Cambridge. Former President of the Cambridge Union and had been a member of the Conservative Association where he had been contemporaries with individuals like Leon Brittan, Normon Lamont, Normon Fowler, Ken Clarke and John Gummer who had gone on to become major political figures. Although not on the official list of candidates Renfrew had sufficiently impressed to win the selection process. Sadly, public meeting attendance was also considered woefully inadequate with Labour typically achieving audiences of 150 as compared to the Conservative Party’s 28 to 90. This might have been in part as a result of timings with clashes being identified with the European Cup and a televised International [Final Report: CCO 500/18/15]. Even an address by the Party Chairman, Anthony Barber, MP on 10 Jun 1968 drew only 90 people. It was only the Public Meeting addressed by Sir Alec Douglas-Home, MP on 11 June that saw a respectable 500 in attendance. A National Opinion Poll (after a weekend constituency survey) predicted a Labour hold of Sheffield Brightside with a majority of around 5,000 but with a swing to the Conservatives of around 18.1% proved well founded. 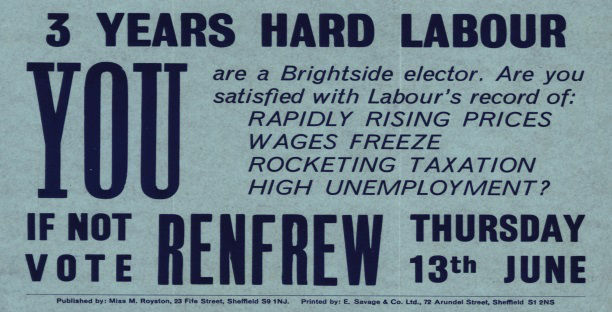 Labour’s Eddie Griffiths won 55.2% of the vote with Colin Renfrew polling 34.8% and Lt. Col. Lambert 2.3% with the remainder shared between the second independent and communist candidates, Ron Guest and Bob Wilkinson. While not a victory for the Conservative Party, with Labour holding on with a 5, 248 majority, the result did constitute a 17.1% swing in their favour. Griffiths went on to represent Sheffield Brightside until 1974 when he was replaced as the constituency Labour candidate by Vera Joan Maynard who retained the seat in the October General Election pushing Griffiths, who had stood as an Independent Labour candidate, into second place. Thereafter he joined the Socialist Democrat Party. Colin Renfrew never stood as a Parliamentary candidate again pursuing instead an eminently successful academic career which saw him elected a fellow of the British Academy (1980), Disney Professor of Archaeology in the University of Cambridge (1981 until his retirement in 2004) and the founding director of the McDonald Institute for Archaeological Research, University of Cambridge (1991). He was created a life peer in 1991 as Baron Renfrew of Kaimsthorn. So far as I have been able to establish, Lt. Col. Lambert’s political career ended with the Sheffield Brightside By-Election.